Because a child is nonverbal, don’t make the mistake of assuming they cannot comprehend what you are saying to them. There are many ways to convey a message without words. Through his research on nonverbal communication in Silent Messages (1971), Dr. Albert Mehrabrian concluded that 93% of communication is nonverbal. The 93% includes tone, gestures, facial expressions, and posture. The facial expressions, gestures, and posture of nonverbal children can help you comprehend what they are conveying to you. In turn, utilize nonverbal tactics to aid nonverbal children in comprehending your message. For example, when you say “let’s go to the gym,” include nonverbal tactics like mimicking the activity (riding a bike, playing basketball) if you don’t know the appropriate sign language, gesture getting up to leave, pointing towards the door, or show a picture if available to help enhance understanding. Hold conversation with nonverbal children the same as you would with anyone else. Typically, hearing is not an issue, and neither is eye sight or touch, so that means nonverbal children have multiple ways to experience culture and to form their own opinions and preferences about the world. One strategy I use to stimulate conversation with nonverbal children is commenting about things in the environment or expanding on topics that the student makes evident by their preferences in clothing, videos, toys, leisure activities, etc. It is a wonderful feeling when you spark the student’s interest through conversation and see them engage in the conversation through their smile, their laugh, or other body language. You’re making them feel included and important by taking the time to speak to them and with them the way they see others being spoken to. Once you get the conversation going, offer variety in how you seek information from a nonverbal child. Minimize use of closed set questions or questions that only require a yes/no response. Consider the type of question you ask that would lead to “yes” or “no”. Can you imagine only being able to say yes or no, and not being able to express indecision or indifference? Another strategy I use with nonverbal children is to try to offer options like “I don’t know, I don’t care, something different, I love it!” in addition to “yes” and “no” when I am asking opinion questions. Exclusive “yes” and “no” responses are most appropriate when attempting to ascertain acceptance or refusal, but “yes” and “no” responses could also be appropriate in different situations. “Yes” and “no” responses can be used to spur reflection and empathy such as, “Do you think that made him feel sad? Does that make you feel sad?” The point is to add texture and context related to how you include the nonverbal child in instruction or conversation so that the child is allowed to fully participate in comprehension, analysis, and reflection of the text or topic. Use humor, because why not? Sharing a moment of humor with someone is a connection that transcends the use of words. Communication breakdowns can happen often between communication partners when one of them is nonverbal; lack of communication can lead to frustration, anxiety, and broken relationships. 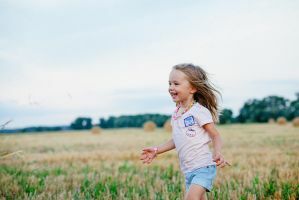 Using humor to bolster positive interactions and rapport could aid you in maintaining the connection with nonverbal children even when there are lapses in communication, because there are more moments of connection and understanding than of miscommunication. Also, it’s a proven fact that humor is a stress reliever and good for your health, so brush up on your comedic chops! Humor can be used to expand conversation with anyone, but especially nonverbal children. One strategy I like to use is playing humorous commercials, preferably ones that do not use words or use nonsense words (think about how Minions speak) and showing humorous cartoons. I also use nonsense cards that depict situations like a person using a phone for a hat and asking the nonverbal student if that is silly or not. These types of cards can be ordered from various educational or speech pathology product companies. You can also expand on that by asking why it’s silly. All behaviors communicate something, so it is especially vital to pay close attention to what nonverbal children may be trying tell you through their behaviors because they can’t verbally indicate it. Because they can’t verbalize it, nonverbal children may have more instances of frustration and anxiety that manifest into maladaptive behaviors such as tantrums, aggression, property destruction, etc. Sometimes, you have to read between the lines and consider events that precede the behavior as well as the consequence of the behavior. Considering the antecedent and the consequence may also aid you in determining the purpose or motive for the behavior. There are vast amounts of literature and resources on behavior analysis that can assist you in reading between the lines as it relates to behavior. I hope that you find these tips helpful and that you use them to engage confidently with nonverbal children. Ka’Nessia Shepard, Ed.D., CCC-SLP, Related Services Manager at The Forbush School at Prince George’s County, has over 15 years of experience working in the field of speech-language pathology in public and non-public educational settings. She has expertise in the areas of autism spectrum disorders, fluency disorders, and augmentative communication. In her capacity as related services manager, she provides speech therapy services, supervises related service providers, and is a member of the compliance team. In her capacity as a school administrator, she facilitates professional development training, implementation of Positive Behavior Intervention and Supports (PBIS), Box Tops for Education collection, fundraising, and parent and community outreach initiatives.